Like DCC, Munchkin is a game where characters have 10 levels, although there is no “0 level”. 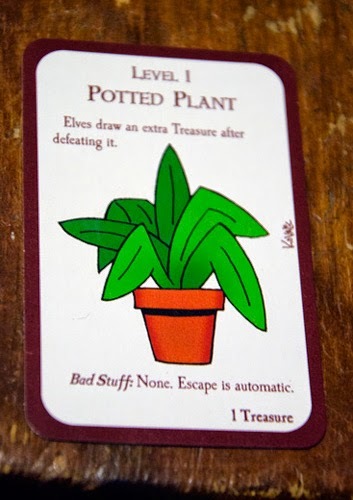 The potted plant can be defeated by a level 1 character and grants an extra treasure card to elves. Nothing bad happens if you can’t defeat it; you can always run away. It should be noted that there is another “potted plant” card that you can use to eliminate something from an opponent. In Munchkin, this means another one of your fellow players! We will attempt to use these factors to create an interesting potted plant that could actually be used in-game. Potted plant: Init +0; Atk whipping leaf fronds +0 melee (1d2); AC 7; HD 1d6; MV 0’; Act 1d20; SP strange luck aura, immune to mind-affecting, elf sap; SV Fort +0, Ref –4, Will +0; AL N.
The potted plant looks like nothing more than a plant in a pot. It is non-sentient (and cannot be attacked by mind-affecting spells or abilities as a result), but it can defend itself by whipping its tough, sharp fronds at opponents in melee range. These potted plants have a strange ability to manipulate chance. When slain, they attach a minor curse to the creature striking the final blow: If that character names an object carried by another character within 10 minutes of killing the plant, that character must succeed in a DC 10 Luck check or the object has been mysteriously lost. If more than one character has the object (“rope”, for instance), then only the character with the lowest Luck and the object is affected. Once 10 minutes has elapsed, or an object has been named (even if it is not lost), the curse ends. There is often treasure hidden near potted plants. This may be because creatures with strange senses of humour hope that the found items will be named and disappear, or it may be because items that disappear due to the plants’ strange luck aura can be found in the vicinity of other plants. In any event, elves have the potential to gain an additional boon when the potted plant is slain: Each potted plant contains an emerald sap. Consuming this sap grants an elf the use of one randomly determined Wizard spell for a period of 2d24 hours, as though it were a spell the elf had learned. Reroll if the elf already knows a spell, and mercurial magic is rolled when the spell is first cast. Even a 0-level elf can utilize a spell acquired in this manner, rolling a 1d20 for her spell check. There is only enough emerald sap in any given potted plant to benefit a single elf. If stored, emerald sap lasts up to 3d3 days before begin to spoil. After that time, the dice rolled for the period the spell can be cast (2d20 hours, 2d16 hours, 2d14 hours, etc. ), and the die used to cast the spell both suffer a –1d shift on the dice chain every 1d3 days. How badly the sap has degraded cannot be known until it is consumed. If the casting die is reduced below 1d10, the elf must make a DC 10 Fort save of suffer 1d3 points of Strength and Stamina damage. 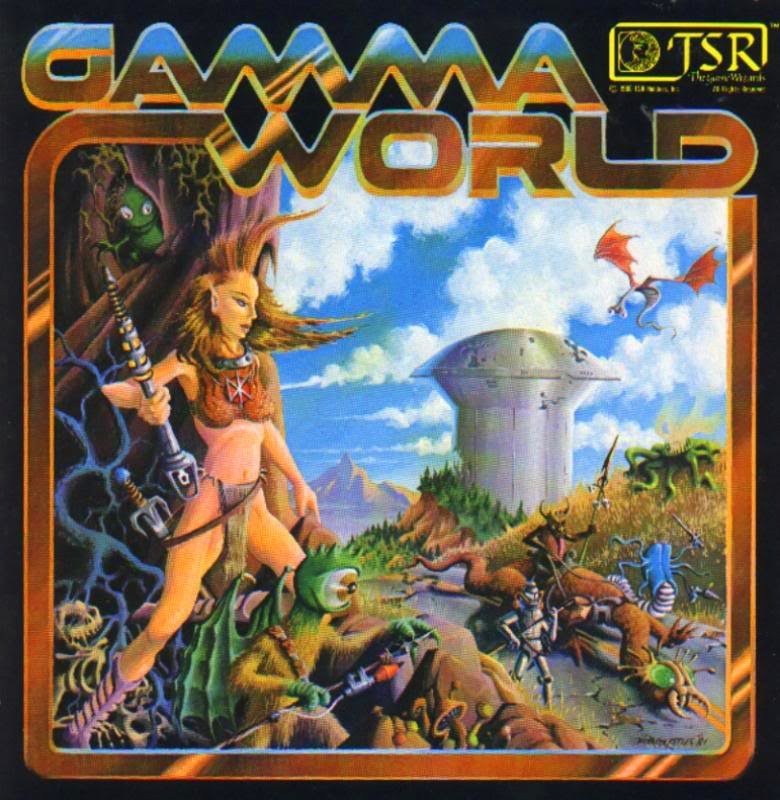 When I converted Paul Reiche III’s Gamma World module, The Albuquerque Starport, to DCC for my own fell purposes, I perforce converted the “flinging fern” in the restroom at Area 7. For a 0-level funnel, this is a tough creature. Luckily, as with the Munchkin version, it is easy enough to get away….unless it hits you. The fern can attack with eight vines as a single action, each of which constricts automatically each round unless severed (2 hp damage, which do not count toward the plant’s total). Each vine can reach up to 15 feet away. Originally this creature was a small potted house plant which was left here by a frightened tourist during the evacuation of the starport. When the cloud of radioactive dust swept over the area, it caused the plant to mutate. Over the years the plant has kept the starport pest-free by devouring all intruders. Mutated house plant: Init +4; Atk 8 vines +0 melee (1d6); AC 9; HD 4d6; hp 20; MV 10’; Act 1d20; SP constriction, explosive seed pods; SV Fort +4, Ref +2, Will +0; AL N.
So, no OGL will be coming.